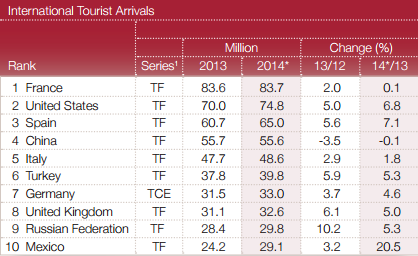 International tourist arrivals hit a record 1.1 billion worldwide in 2014, up from 1 billion the year before. It is the fifth consecutive year in which numbers have shown growth above the long-term average. Europe saw the biggest rise in absolute numbers but the Americas and Asia also showed significant growth. France was the most visited country with over 83 million inbound tourists. That figure was nearly 10 million ahead of the next country on the list, the United States. While France’s visitor numbers remained stable, the United States and Spain, number three on the list, attracted more than four million more tourists than the year before. China attracted 55 million visitors, most of which were from Hong Kong, Macau and Taiwan. The other countries in the top 10 showed steady growth in numbers except Mexico which jumped from 24 million to over 29 million in 12 months. When ranked in terms of the amount of income earned through international tourism the picture changes significantly. The United States is way ahead at number one with $177 billion. Spain, number two, had only just above one third of that income at $65 billion. China earned more than France which, while top of the chart for number of visitors, is number four for income with $55 billion. 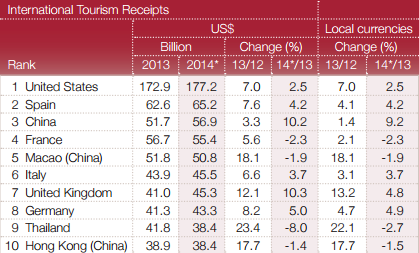 Thailand and Hong Kong both appear in the top 10 for income despite not featuring in the top 10 for visitor numbers. 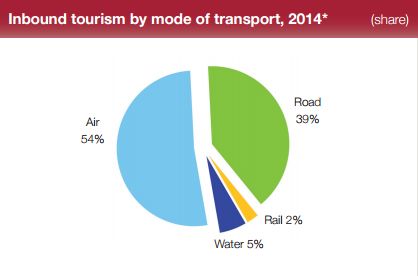 Looking at modes of transport used for international tourism, not surprisingly air travel is the most common; 54% of visitors flew in. Most of the rest drove, with 39% of tourists arriving by road. Only 5% sailed to their destination and even fewer, 2%, took the train across the border.